DNA microarrays are a technology used to measure the expression levels of thousands of genes together and at times, all genes in a genome at the same time. There are two types of DNA microarrays, cDNA (complementary DNA), and oDNA (oligonucleotide DNA) with oDNA dominating the market with a share of almost 98%. The global DNA and gene chip (Microarray) market offers tremendous growth potential and has witnessed the entry of a number of players striving for a share in this market. The global DNA & gene chip (microarray) market was valued at $760 million in 2010 and is expected to reach $1,425.2 million by 2015 growing at a CAGR of and 13.4%. Affymetrix, Inc. dominate this market mainly due to high density of their chips, sizeable number of patents, first-to-market presence, and many research and commercial partnerships. The other players include Illumina, Inc., Agilent Technologies, Inc., Roche Nimblegen, Sequenom Inc., Applied Microarrays, and others. North America dominated the global DNA and gene chip market with maximum share in 2010. However, this share is likely to drop down in 2015 as the market has already reached maturity. Growth is expected from the Asian economies, especially China, India, South Korea, and Singapore, where government funding and investments in biotechnology play major roles. China and India being the most populous countries would provide the largest base for clinical trials and drug discovery; and thus will positively impact the DNA microarray market. Singapore is amongst the most preferred locations for setting up manufacturing facilities for biotechnology and pharmaceutical companies due to strong intellectual property laws, excellent supply chain, and logistics connectivity. It offers world-class scientific infrastructure, safety and regulatory record, and a highly skilled 13,000-strong biomedical workforce. Therefore, it has been identified as one of the top five biotech hotspots of the world. Singapore's robust process R&D capabilities in electronics and precision engineering, large pool of well-educated workers, reduced cost, and competitive tax environment are the prime reasons for companies such as Affymetrix and Illumina to move their manufacturing bases to Singapore. Gene expression currently forms the largest application market as gene expression products have diverse usage in areas such as clinical diagnostics, biodefense, and agriculture that are gaining tremendous government funding. While this application contributed 28% to the global DNA & gene chip (microarray) market revenues in 2010, cancer diagnosis and treatment application is expected to dominate the applications market by 2015; accounting for about 24% share in the market. Each section provides market data, market drivers, trends and opportunities, top-selling products, key players, and competitive outlook. This report also provides market tables for covering the sub-segments. In addition, the report provides more than 30 company profiles covering all the sub-segments. DNA microarray is the largest contributing segment of the biochip family. DNA microarrays studied in this report are categorized by cDNA (complementary DNA) and oDNA (oligonucleotide DNA), of which oDNA account for as high as 98% of the total market. The prime reason is the high specificity these chips offer with shorter probes. Affymetrix, Inc. (U.S.) is the pioneer in oDNA microarrays. The company commercialized its products in 1989 and since then has been the market leader. However, the market share is found depleting with the passage of each year. The global DNA & gene chip market was valued at $760 million in 2010 and is expected to reach $1,425.2 million by 2015; growing at a CAGR of and 13.4%. The DNA microarray market is influenced by its parent (biotechnology) market with North America and Europe accounting for a larger chunk in the red sector (human health) of the biotech market and the Asian economies more focused towards the green sector (agricultural and zoo-technical sector). 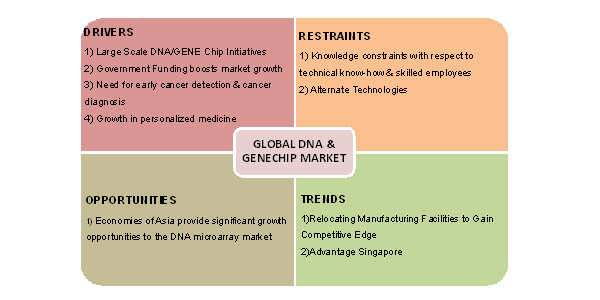 The DNA & gene chip market is primarily driven by growth in personalized medicine, need for early cancer detection & cancer diagnosis, and government funding. Many Companies developing microarray technologies also depend on funds received by the government as their main customers include government laboratories, academic centers, and clinical research organizations. The Asian countries provide immense growth opportunities for the DNA microarray markets as this region accounts for more than half of the world population and the government in these countries has planned substantial budget allocations for developing the biotechnology sector. Besides, Affymetrix, Inc (U.S.) and Illumina, Inc. (U.S.) have relocated their manufacturing facilities in the Asian sub-continent to take advantage of the growing demand and gain competitive edge in the region with large number of regional players.